If you are going to be involved in any real estate transactions, hiring a real estate attorney can save you time and money. How, do you ask? Real estate attorneys specialize in negotiating prices and terms, meeting deadlines, and corresponding between loans. An experienced attorney can catch mistakes and save you money at the same time. Once you begin the journey into real estate, an experienced attorney can spot any mistakes and save you money at the same time. You will be relieved to have that extra pair of eyes watching your back and your investment. Whether you are a first-time buyer or selling a home, it is one of the largest purchasing decisions you will make. Without an agent, a real estate lawyer will take care of all the little details that can be overwhelming and stressful. Do not make the mistake of working alone. Buyers who are considering new construction benefit from consulting a real estate attorney because the sale contracts can vary from builder to builder. Buyers who are not familiar with local builders or with real estate contracts in general, should have an advocate looking out for their best interests. Although there are real estate agents who will exclusively represent buyers or sellers, agents on both sides of the transaction are usually compensated based on a percentage of the final sales price. As a result, there is rarely an incentive to work aggressively for a lower sale price for buyers. Attorneys are held to higher legal standards in all transactions. Transfers of real estate can become even more complex than usual when execution of an estate is involved. The dealings can easily become emotionally charged when close and not-so-close family members must agree upon selling property, especially when ownership interests were not clearly defined beforehand. An experienced and skilled real estate attorney can be indispensible in establishing a chain of title, defining appropriate types of ownership interests and ensuring that they are properly recorded in order to avoid any future disputes. 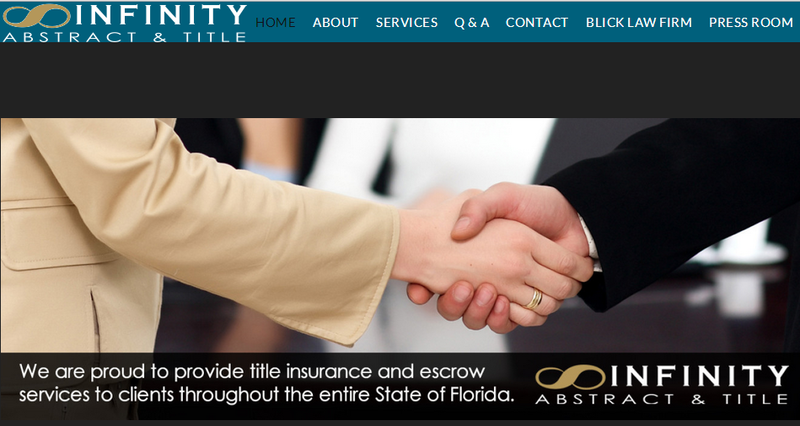 We are proud to provide title insurance and escrow services to clients throughout the entire State of Florida and many states nationwide. We have in-house counsel to provide both residential and commercial customers with the highest level of expertise and service. We are proud to build our business and reputation on quality, service and integrity. As a result, we enjoy longstanding relationships with our customers who, in turn, regularly recommend us to their friends, family, and associates. We are innovative, aggressive, and results-oriented when answering the wide variety of title needs for our customers. We have represented many people throughout the state of Florida and the United States. We have mobile closings throughout the entire state of Florida. Please visit our title company, Infinity Abstract & Title for more on our services. Old Republic Title Insurance Company, WFG National Title Insurance Company, and Chicago Title Insurance Company. Title insurance is extremely important when purchasing or refinancing a piece of property. Yet many consumers are unsure about what title insurance is and what it protects against. Here are some answers to the more common questions about title insurance. • How Am I Protected? • I’m refinancing, why do I need title insurance? • I’m buying a newly built home, do I need title insurance? There are two types of title insurance: Lenders title insurance, also called a Loan Policy, and Owner’s title insurance. Most lenders require a Loan Policy when they issue you a loan. The Loan Policy is usually based on the dollar amount of your loan, but can be up to 125% of the loan amount. It protects the lender’s first priority lien interest in the property should a problem with title arise. The loan policy coverage decreases and eventually disappears as the loan is paid off. The Owner’s Policy is always issued in the amount of the real estate purchase. It is purchased for a one-time fee at closing and lasts as long as you or your heirs have an interest in the property. This may even be after the insured has sold the property. Only Owner’s title insurance fully protects the buyer should a problem arise with the title that was not uncovered during the title search. Owner’s title insurance also pays for any legal fees involved in defending a claim to your title. Prices and who pays for title insurance vary from state to state. On much of the West Coast, the seller pays the title insurance premium for the buyer. In other states the buyer obtains an Owner’s policy on his/her own. Please visit our title company, Infinity Abstract & Title for more on our services. In order to issue title insurance, the title company must search public land records for matters affecting that title. Many search the “chain” of title back 50 years. One in four title searches find a title problem that is fixed before title insurance is issued. Some examples of items that can cause a problem are: fraudulent or improperly prepared deeds, open mortgages, wills, probate proceedings, and trusts that contain improper information; outstanding judgments or tax liens against the property or individuals, covenants and restrictions, and easements. Title companies address what needs to be done to fix the problems, and then once those requirements have been met the transaction can be closed, and title insurance issued. Occasionally, in spite of an exhaustive title search, hidden hazards can emerge after closing. Things such as mistakes in the public record, previously undisclosed heirs claiming to own the property; or fraud could cloud the title. Title insurance offers financial protection against these by negotiating with third parties, and paying claims and the legal fees involved in defending the title. Please visit our title company, Infinity Abstract & Title for more on our services. (NAPS) — Those involved in real estate fraud and forgery can be clever and persistent, which can spell trouble for your home purchase or for the lender when giving a loan. Fraud and forgery are examples of hidden title hazards that can remain undetected until after a closing despite the most careful precautions. Although emphasizing risk elimination, a title insurance policy protects financially through negotiation by the insurer with third parties, payment for defending against an attack on the title as insured, and payment of valid claims. (NAPS) – When buying a home, it’s important to remember that what you don’t know, can cost you. ALTA reminded that owner’s title insurance is necessary to fully protect a home buyer. Lender’s title insurance, which is usually required by the mortgage lender, serves as protection only for the lending institution. Please visit our title company, Infinity Abstract & Title for more on our services. When you refinance you are obtaining a new loan, even if you stay with your original lender. Your lender will require Lender’s title insurance to protect their investment in the property. You will not need to purchase a new Owner’s title policy; the one you bought at the original closing is good for as long as you and your heirs have an interest in the property. Even if you recently purchased or refinanced your home, there are some problems that could arise with the title. For instance, you might have incurred a mechanics lien from a contractor who claims he/she has not been paid. Or you might have a judgment placed on your house due to unpaid taxes, homeowner dues, or child support for instance. The lender needs reassurance that the title to the property they are financing is clear, and that there loan has first priority. If it has been no more than 10 years since you bought your house or refinanced, ask for a reissue or discount rate. Discounts are not available in every state and you might have to meet some criteria to be eligible, so be sure to ask. Please visit our title company, Infinity Abstract & Title for more on our services. Construction of a new home raises special title problems for the lender and owner. You may think you are the first owner when constructing a home on a purchased lot. However, there were most likely many prior owners of the unimproved land. A title search will uncover any existing liens and a survey will determine the boundaries of the property being purchased. In addition, builders routinely fail to pay subcontractors and suppliers. This could result in the subcontractor or supplier placing a lien on your property. Again, lenders want to be sure the property has clear title, and that their loan has first priority. Purchasing owner’s title insurance will protect you against these potential problems and pay for any legal fees involved in defending a claim. Please visit our title company, Infinity Abstract & Title for more on our services. Stop your home from going into foreclosure! There is a way out with Blick Law Firm’s expert legal assistance. Here at our firm, we will inform you of the options you have when dealing with a foreclosure. You do not have to loose your home and face the negative effects of a bad credit report because of your circumstance. Contact our office and talk with our foreclosure defense attorney today. We will make sure you know all your options and if able can prevent foreclosure with loan modification or short sale services we offer. When dealing with a foreclosure, you are only allotted a certain amount of days to answer the lawsuit. If you do not respond, you not be able to get a hearing to be properly represented. With those deadlines in mind, it is important that you contact a foreclosure lawyer as soon as possible. If you want to have any chance in saving your home, contact Blick Law Firm today. When evaluating whether or not to hire a loan modification attorney, Tampa homeowners and others across the state of Florida who are faced with increasingly unaffordable loan payments, need to know some facts. It is very challenging to handle loan modifications without the experience of an attorney. The enormous time demands, the stress of having to deal with the lenders employees, and the complexity of the process are just three of the many reasons that people look for help with their loan modifications. If you try to handle the process on your own, you will have to realistically assess the amount of available time you have for the project. It is difficult (if not impossible) to reach anyone who has the authority to review your loan file and arrange for the modification. Most likely, you will have to spend several hours on the phone each day, either on hold or calling, hanging up and calling again. This may continue for weeks or months. If you have a job, you may not have the kind of time it takes to be as persistent as you will need to be in order to reach someone in a position of authority who is willing to work with you. And if you finally do succeed in making contact with an appropriate person, will you be able to accurately evaluate whether they are dealing with you in an open and honest manner? They are employees of the lender and have no incentive to take your best interests into consideration. That means you will be left to advocate for yourself. Aside from the complexity of the financial transaction itself, it is difficult to make good decisions during times of extreme stress. Exposing your emotional vulnerability or anger is never a good tactical move when negotiating contracts, and may put you at a disadvantage. And many people are mislead into thinking they can save money by hiring a loan modification company instead of an attorney. But an attorney knows how to analyze your individual case, based on the documentation in your file and the procedures that occurred during the origination, processing and closing of your particular loan. He can investigate your particular situation and find areas that can motivate your lender to agree to a loan modification. He can also give you legal advice and represent you in court if you need those services. A loan modification company can’t. Although hiring an attorney for loan modification may seem difficult because your finances are already stretched too thin, the outcome it produces is worthwhile when it helps you avoid foreclosure and produces a loan payment that you can afford. 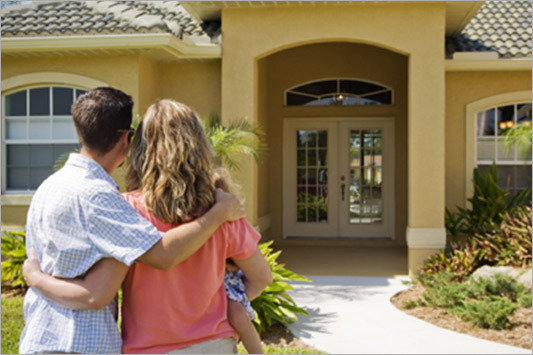 Blick Law Firm provides legal services for short sale transactions all across the state of Florida. The majority of real estate sales taking place at this time are short sales. We offer many years of expert experience when it comes to short sales services. Short sales are the sale of properties for less than the current amount owed to the lender. Most lenders are now working with sellers based upon the reduced property calues, both in Florida and throughout the country. While short sales do not allow a seller to realize any gain in the sale of their property, it is a way for many sellers to avoid foreclosure on their property. Every condo owner knows how complicated homeowner association bylaws can be. In real estate law, typically the larger governing bodies have the least complex laws, with the most restrictive laws imposed by the local authorities. This means state laws have fewer restrictions than counties, and counties have fewer restrictions than cities or towns. It also means that condo association rules are more restrictive than the laws for the cities that the condos are located in. And some of the association bylaws are a nightmare to navigate. An experienced real estate attorney is essential for potential buyers in order to evaluate restrictive covenants and condominium association financial obligations. We are here to help you. Blick Law Firm prides itself in real estate law. We work with probates, foreclosure defense, and title insurance services as well. With the right attorney representing you, like Blick Law Firm, you could potentially save yourself thousands (or millions) of dollars. That sounds like a good deal to me!